yrh and pull though 2 loops. Next Row - 1ch, 1dc into base of 1ch, 1dc into each dc to end. Turn. Fasten off. Rpt Pattern Rows 1 to 4 twice more, then work Pattern Row 1 once. Turn. Fasten off. Next Row - Join in cream coloured yarn, 1ch, 1dc into each stitch to end. Turn. Fasten off. Next Row - 1ch, 1dc into base of 1ch, 1dc into dc to end. Turn. Rpt last row once. 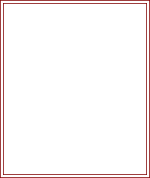 Work Pattern Rows 1 to 4 four more times in same colour sequence as before. With WS facing, fold hood in half and ss dc's together from both sides to make hood. (see pic below) Fasten off. into each dc down first side of scarf, 3dc into corner, work 1dc into each ch along cast on edge to corner, 3dc into corner, 1dc into each row end up second side of scarf, 3dc into corner, 1dc into each dc along scarf edge to ho od, ss to first dc. Turn. to first dc. Fasten off. 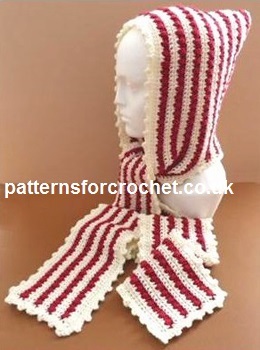 Hope you enjoy this free crochet pattern for a scoodie.